The only history lesson I've ever had trouble putting down. Addictive story and gameplay; stunning visuals including anime cutscenes; highest quality on the PSP in a while. How hard it is to come with cons; tactics based battle system can be a bit dry when levelling; bosses that just won't die "completely." Originally named Jehanne, Jeanne d'Arc would be her modern French name, and in English literature she would be known as Joan of Arc. A story of a woman that lead the French into battle with the supposed help of god as her guide, Jeanne led them to a seemingly impossible victory over the English in the early 1400's. This religious story of triumph and glory has been told a thousand times in books, song, theatre, film, and now video game. A great story for a video game to say the least, and upon combining it with a great character set, and tactical gameplay straight from Final Fantasy, you've got a solid title that people just want to play more to see what happens. Jeanne d'Arc is a great handheld with high production value, exceeding all expectations and surprising me into a large loss of free time. 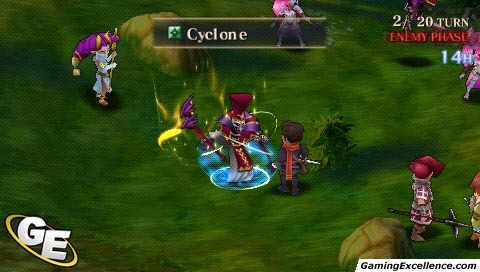 Definitely the best RPG I've played on the PSP. This video game adaptation of the story keeps to the key notes of the story, but adds some magical swords and goblins for good measure. 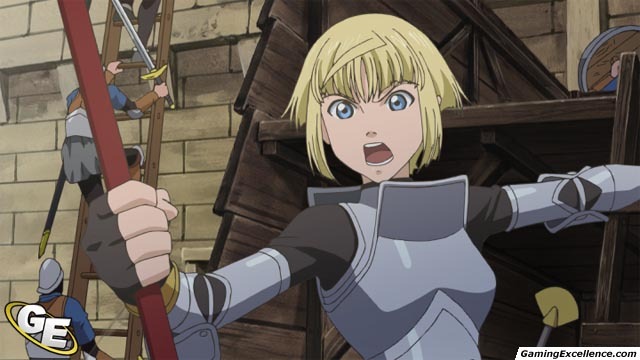 Jeanne d'Arc is simply a fantasy version of the story, and it's been done very well. The English swarm Joan's hometown and in her flee she decides to help out a soldier. After the battle the man falls to his demise and his magical bracelet releases from him and grasps to Joan's wrist. This bracelet ties Jeanne to a group of elite soldiers of god. Jeanne gets all badass all of a sudden, cuts her hair in a very Mulan-esque manner, and the battle begins. Again, this is very much so a fantasy based version of the story, but it ties together very nicely. 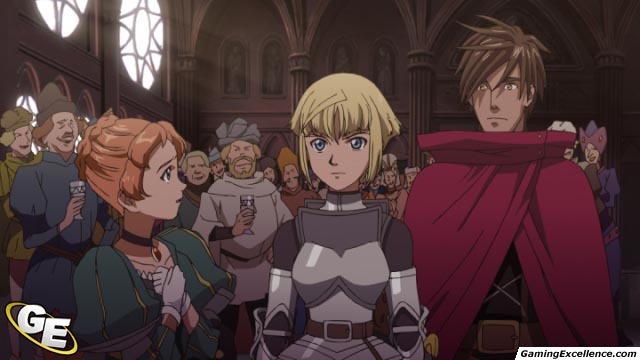 The cast of characters, like many RPGs before it, is a large part of what drives the strong story in Jeanne d'Arc. Joan is a heroine with newfound powers and an instant army at her disposal; some friends, some acquaintances, and some with secret crushes on her. The story is aided by amazing anime cutscenes as well, developing the characters in ways the dialogue could never do. England's invasion of France will take you anywhere from 25 to 40 hours to fend off, and the story just gets better along the way. 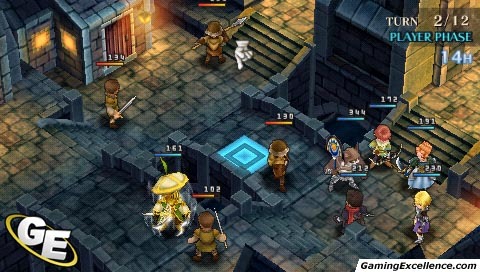 Being a strategic RPG, the gameplay mainly consists of map area selections, and strategic battle. 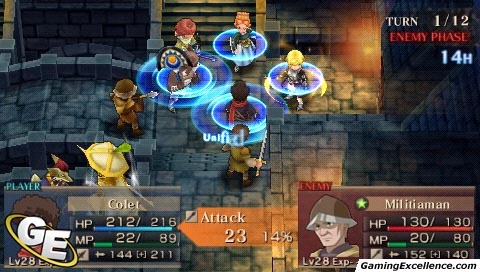 The strategy includes character selection and placement, upgrade slots, weapons and armor, player movement and placement (height is an advantage), and items and spells. Its turn based which can be a little slow paced, but there's always a specific goal which adds a sense of urgency to the whole battle. Terrain and the way each character is facing always plays a factor in the damage dealt, as does critical hits and dodging. 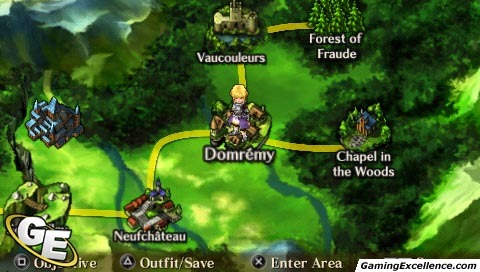 The battles never really seem to drag on as maps are decently small and there's always someone approaching. The bracelets that Jeanne and the elite group of religious soldiers wear act almost like a "limit break." Different jewels used (like magic points earned after each turn) on the bracelet will give the character a change of uniform as well as some special powers. Aside from being armoured to the nines after the glowing transformation and packing a punch more than double the hit points than before, they can also increase range, critical hit abilities, and more. 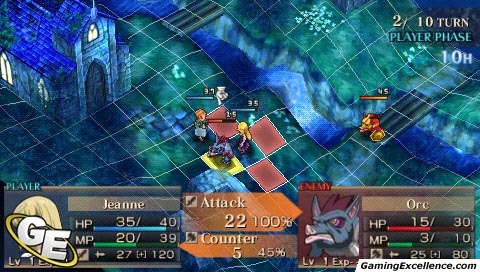 Killing an enemy grants the righteous character an extra move, meaning a strategic transformation will have Joan sweeping the map up in a hurry. Utilizing these powers is essential in later maps as it seems the right timing is all it takes to bring down your target. "Burning Auras" adds another sense of urgency to the battle as the ring of fire will appear adjacent to the side an enemy was attacked on. You'll scramble trying to reach that weak spot before your turn ends as the square grants extra attack damage during your second attack. The enemies rarely take note of these spots so don't worry about that. But if you attack in the right order, auras can easily help you out, especially with a transformed character. Counterattacks are percentage based so making sure your team can dodge well and land counters aplenty is a good route to take. Long range attacks like spears and bows aren't countered so levelling up these typically weaker characters is always beneficial. The strategy becomes even more complex with skill stones; additives collected by looting or created by fusing lower level stones together with the help of a frog who likes to chomp them up. These will give you new spells and skill upgrades for each character. The slots are limited based on what level the character is and there are restrictions to what stones each character can equip based on the weapon of choice. You can also buy these stones in shops but they run a pretty penny so it's best to scour the land while levelling your characters. The skill-binding menu comes along a couple hours into the game and boasts hundreds of combinations. Some higher level stones seem to only be available by fusing other rare stones, but more common ones will have multiple combinations that lead to their production. Take the stone attack + 10 for example; it can be obtained by fusing two attack +5's, or an attack +5 and two fireball 1's, et cetera. It's much like gambling in the sense that you won't know the outcome until you simply try the combination out, but coming across a rare and useful stone from fusing a couple random ones you're not using anymore can be quite fulfilling. 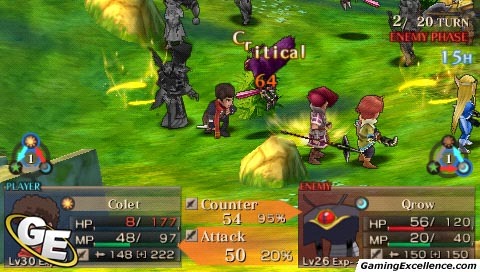 Each character not only has a set weapon class, but they can also have a set element class. This is customized by stones as well, such as Luna, Stella, and Sol (+ levels attached, ex. Luna + 3). These act much like rock-paper-scissors setup whereas Luna is strong against Sol but weak against Stella, and so on. This may all sound quite confusing on paper, but it's quite simple in game and makes for an interesting setup experience before every matchup. 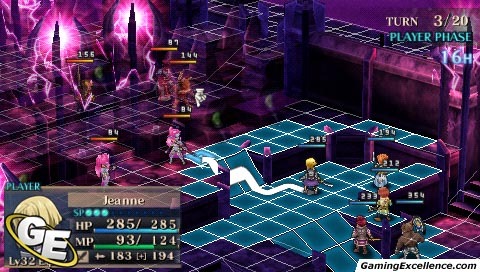 Making sure you've got everything set up perfect for the foes you'll meet is half the fun, which is understandably hard to believe, but trying Jeanne d'Arc out is the only way you'll find out for yourself. Overall Jeanne d'Arc is not ground breaking in an innovative frame of mind. Nothing is really new but everything is still excellent. 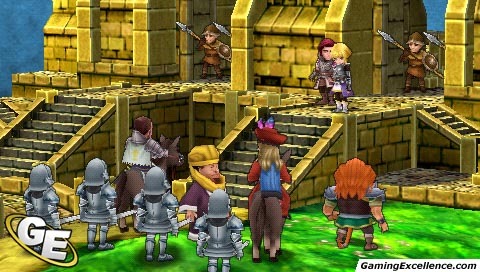 It's a perfect SRPG formula that plays superbly on PSP. Level 5 has made a solid game with great replay value. It's attractive visually and audibly, with an in-depth story, great characters, and features many ways to provide variations on battle strategies. The cut scenes included are high quality which begs the question, how did they fit it on a UMD? Dialogue is in place of voice acting so maybe that's where the extra space should've gone too to keep things rolling but it is an RPG, and thus should be more like a story. 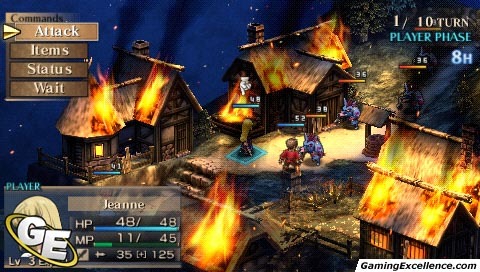 Jeanne d'Arc is a perfect mix of folklore and fantasy and is my pick for handheld RPG of the year thus far. Everything put together deserves appraisal and is definitely worth the price tag. Warren Dunlop is the man behind the eye candy you'll see on GamingExcellence. He's been building hand-eye co-ordination since '91 and isn't close to stopping anytime soon.